Cate: Please welcome Jeanne Bannon. Jeanne, will you please share a short bio with us? Jeanne: I’ve worked in the publishing industry for over 20 years. First as a freelance writer and then as an editor. After having several short stories published, I tried my hand at novel writing. Invisible is my debut novel. Cate: Congrats! Tell us about Invisible and where it's available. 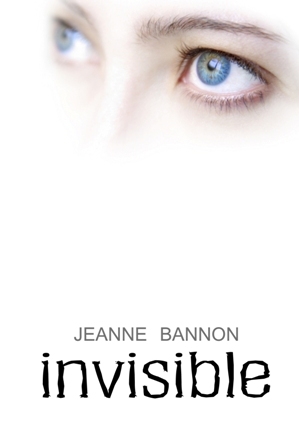 Jeanne: Invisible, is about a teenage girl who isn’t happy with herself and wishes she could disappear. And one day she does. Invisible is available on Amazon, Smashwords, and the Solstice Publishing website. Cate: Very cool premise. Can you tell us why we're going to love your hero? Jeanne: Lola is just an average girl. She’s not a gorgeous heroine who saves the world. She’s overweight, she doesn’t think she’s pretty. Doesn’t expect to ever have a boyfriend, and she’s the victim of bullies. But Lola finds an inner strength she didn’t know she possessed and rises above it all. Invisible is the story of the underdog and who can’t help but root for the underdog? Cate: Love it. Tease us with one little thing about your fictional world that makes it different from others. Jeanne: Perhaps the thing that makes my fictional world different is the cast of characters. There are Lola’s tattooed and pierced parents who are cooler than she’ll ever be. Her androgynous best friend, Charlie and her eccentric Grandma Rose. These characters along with Lola make for an interesting fictional environment. Jeanne: I’m finishing up work on my paranormal thriller, Dark Angel. It’s three times the length of Invisible and much more complicated. I started Dark Angel two and a half years ago and I think it’s about time I finish. Cate: Very cool. What inspired you to draft your first story? Jeanne: Events in my own life. I had a hard time with bullies in grades 7 and 8 and wished I could disappear. However, I look at Invisible as a gift as if came to me as if it were whispered in my ear. I completed it four months. Jeanne: I used to! But now that Invisible has been released, I’m doing more promotion than writing. I’m itching to get back to my writing routine which used to be three to four hours of writing a day, every day. Jeanne: Hmmm, what a great question. I suppose I’d like to know if readers prefer perfect, pretty characters to flawed not so good looking characters in YA novels. And what do they think of reading a novel written in first person present? Cate: Readers, Jeanne Bannon is giving away a book, in both ebook and paperback formats, to a random commenter... so start commenting. She'll pick a winner on October 12th and announce the winner here. Thanks so much for being my guest Jeanne! Best of luck to you. Loved your book! Great interview. Thanks for putting Bannon in the spotlight were she belongs, Cate. I loved Invisible, enjoyed reading about the author. Lola is an east character to fall in love with. Susan Stec, author, The Grateful Undead series. Do love the cover! I can already relate to your story. Great interview! Great Interview !! I like this story , it's not your average heroine story , it'd different and unique. Hope to win a copy !! Thanks for stopping by, Crystal :) Good luck! Characters that are too perfect are hard to relate too and to root for. Am I too late to enter the draw? Jeanne's blurb is sooo intriguing! Thanks Cate for spotlighting her! I'd like to announce the winners of INVISIBLE. I used random.org to randomly chose the winners. Crystal Trent Dobson is the winner of the book and Emmy Swain, the winner of the paperback. Crystal, I have your email address and will be touch with you shortly. Emmy would you kindly leave your email address...thanks! Thank you to Cate for hosting me and congratulations to the winners! I'm awed that the book was written and wrapped up in such a short time. Invisible really was a gift. Thank you, Jeanne. I am very excited about my win and look forward to reading Invisible. Also, many thanks to you and your Author Spotlight, Cate. Very nice! I was a fortunate winner of this book. Invisible is a fantastic read! Jeanne captured just about every emotion in this great book for teens. From sad to happy, fearful to fearless, Lola turns revenge into self worth. I laughed, cried and was surprised at the super power that young Lola possessed. Most all of us have colorful, sometimes clashing characters in our lives. Jeanne managed to weave them into the story, with a happy ending for all. I highly recommend this book for teenagers, teachers and guidance counselors.